An American photographer and filmmaker, Alex Prager is known for film-like images of staged sets and models that reference a range of themes, from the history of Hollywood and photography to the cinematic image in art contexts. Exaggerated and costumed, her subjects speak to the ambiguity of seduction and spectacle. A major new exhibition of the photographer’s work will soon be on view at The Photographers’ Gallery in London. Titled Silver Lake Drive, it marks the first mid-career survey of this compelling artist. Tracing Prager’s career over the last ten years and displayed over two gallery floors, the show features over 40 photographs, including her trademark, large-scale Technicolor photographs, as well as her complete film works. 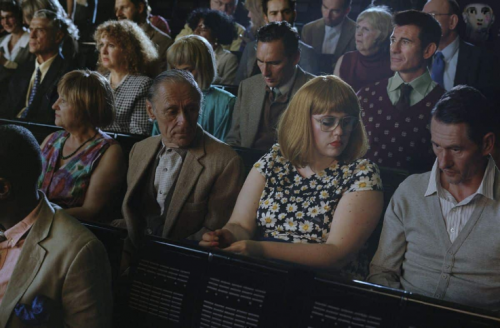 Crossing the worlds of art, fashion, photography and film, the scenes constructed by Alex Prager reveal the human melodrama and dark unsettling undercurrents. Taking her cues from mid-twentieth century Hollywood cinema and fashion photography, as well photographers such as William Eggleston, Diane Arbus and Cindy Sherman, she produces unnerving images that resemble vintage movie stills. Crisp, boldly colored, shot from unexpected angles, and dramatically lit, her images are imbued with a range of emotional layers and narrative possibilities. In Prager’s tableaux, the female figure features prominently as the central protagonist, often positioned as the central protagonist through composition, camera angle and costume. The artist also has a penchant for spaces where people are found together in close proximity to others, often unwillingly, such as streets, beaches or airports. Referencing the aesthetics of Film Noir, as well as the work of Maya Deren and Alain Resnais, Prager’s films also feature women as main protagonists, portraying a range of sharply contrasting emotional states. The artist describes these immersive film installations as “full-sensory visions” of her photography work. While her early film work was predominantly shot in Los Angeles, her latest project takes place in The Opera Bastille in Paris. With Emilie Cozette as the main protagonist, Prager captures the various stages of performance for a prima ballerina. The exhibition Alex Prager: Silver Lake Drive will be on view at The Photographers’ Gallery in London from June 15th until October 14th, 2018. It is curated by Nathalie Herschdorfer and produced in collaboration with the Museum of Fine Arts Le Locle, Lehmann Maupin, New York and The Photographer’s Gallery. It will be accompanied by a fully illustrated catalogpublished with Thames & Hudson on June 14th, 2018. The price of the catalog will be £40 (≈$53.5).